Skinny fence, determined duo. Photo: Pixabay. In 2008, veteran eventer and Olympian Jim Wofford wrote the tremendously outspoken article Eventing Lives in The Balance for Practical Horseman. Every year or so this article crops up on Facebook again, reading as fresh and relevant as it did the day it was released–or perhaps more so, because every time it rises up, it’s a rash of eventing catastrophes that awoke it from its slumber. In the past weeks we’ve lost several horses and riders on the cross-country course. We have to be careful out there, that goes without saying. Eventing was never a cautious person’s sport, which means as riders, the temptation to go to the extreme edges of safety is always there. Which…. isn’t always going to happen. Eventing Lives in the Balance has been haunting me since it was published, when I had a farm and an eventing prospect and was trying to understand what had happened to the sport I’d grown up in. I didn’t know then if there was a future for me in eventing, when I’d always before seen myself growing into an upper-level rider. Writing Pride over the past two years and thinking very hard about the push and pull of dressage on our horses has made this article come alive for me in new ways. 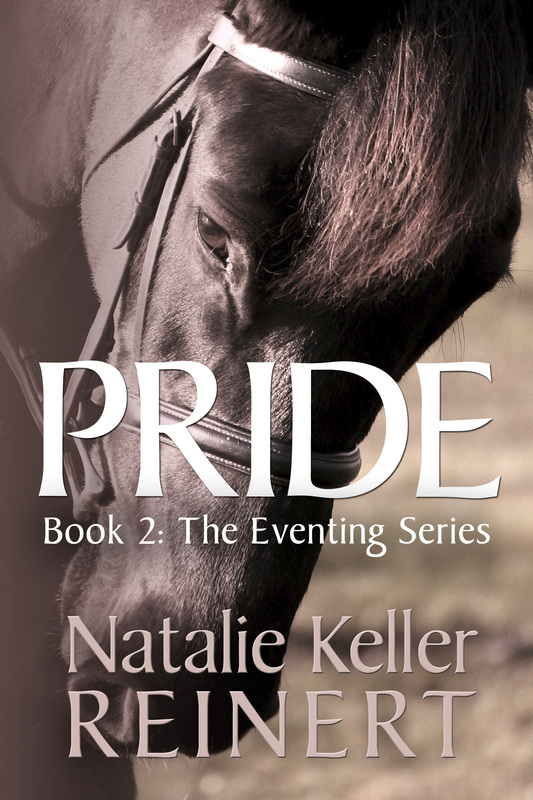 In Pride, I take an average cross-country loving event girl and make her face up to her dressage ghosts. A potential sponsor explains to her that however much she loves her galloping, long format is over. The Military is for the history books. This is the new face of eventing. Comply or die, to borrow a name from a steeplechase champion. Maybe 800 words isn’t a great TL;DR, but what can I say: eventing makes me wordy. It’s why I decided to write novels about it. Anyway, find the horse you’ll trust with your life, and give him a carrot for me. May the eventing gods smile on your ride time. >>>>Read the entire article by Jim Wofford at Practical Horseman. Many thanks to Kirsten Collins for this great report from Thoroughbreds for All. Kirsten shares her life with three OTTBs at her own Harmony Farm. First, a confession: I bought my ticket for Thoroughbreds For All! before I bought my Rolex tickets. I offer this as testament as to how great this event was last year. The event is built around show-casing Thoroughbreds transitioning from the track into new careers. Here, the horses are the stars of the show and I couldn’t wait to experience it again. I was not disappointed. The event drew an even larger crowd this year, around 500 people, but West Wind Farm was easily able to handle it. I can’t imagine a better venue than West Wind’s covered arena with its views of the lush spring Kentucky landscape as well as the ability to accommodate dozens of tables, caterers, a cash bar, and best of all, an enormous barn aisle that facilitated a close look at a nice crop of New Vocations Thoroughbreds. The program followed last year’s winning formula with minor changes. Everyone enjoyed Hall of Fame jockey Chris McCarron getting legged up immediately on a very pretty Bilan. Chris asked Bilan to stay close to the spectators (we had been reminded at the start to hold our applause so as not to startle the horses) and Bilan acquiesced in a very Thoroughbred way by jigging and looking and by not relaxing. This was the perfect segue into Chris’ on-board lecture of how jockeys work with their mounts. First, they seek cooperation, and then they seek ways to make their mounts comfortable. For Chris and Bilan, this involved some give-and-take: Chris asked “Please walk forward to the crowd” and Bilan replied “I’d feel much better if we trot back to the other end of the arena.” And so Chris allowed him to take little breaks and move away, all the while stroking and rewarding him, and then bringing him back to the crowd for a little more exposure. Chris polled the audience at times, seeking answers to questions about what a horse needs and what impacts a successful ride. He said he wants a confident mount, but that of course requires a confident rider. Chris said a rider brings three things into the equation that will influence the quality of the ride: fear, experience level, and rider fitness. Chris stated matter-of-factly that horses are looking for a leader. A rider can provide that leadership but only if they are honest about their own abilities in the tack. And at this point Chris pointed out that Bilan’s behavior was quite normal for some Thoroughbreds and he wisely reminded people to make sure they seriously considered their own ability to handle and accept this type of horse behavior. As if we couldn’t love him more. The rider fitness remark surprised me a little, but what McCarron meant was you have to be able to physically handle that give-and-take phase with your Thoroughbred. He’ll require a soft hand, yes, but still a firm one over the duration of your ride. He cautioned everyone about getting physically tired, losing their form, and then losing the quality of the ride. And he’s absolutely right; a horse deserves us to be our best in the tack because it is what we are almost always asking of our mounts. By this time Chris had his horse moving well around the arena and it took physical restraint not to applaud both Chris McCarron and the lovely Bilan. At some point I lost count of the New Vocations horses that were presented next, but I think there were between six and eight. Each one fell under the gaze of Phillip Dutton and his vet (and fellow eventer) Dr. Kevin Keane. Through their assessment my novice eyes could gain appreciation for traits both physical and mental. Phillip is a quiet soft-spoken man who seemed indefatigable and able to look at every horse with fresh eyes. Dr. Keane echoed many of Phillip’s sentiments about each horse. In one case both of them were quite keen on a filly that I had dismissed the minute she entered the arena: they both saw potential in the young horse and therefore helped me (and countless others, no doubt) to see this horse for her what her future could be. It was an important lesson. 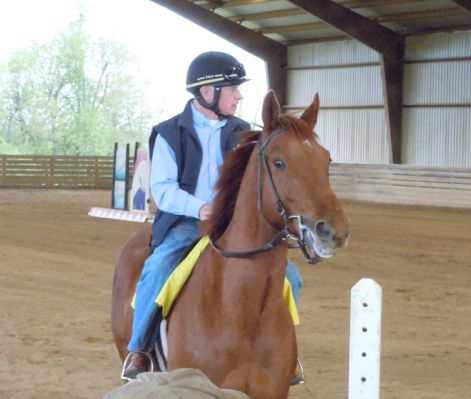 Once the riders were mounted and the horses put through their paces, Dr. Keane remarked that he liked to stand close to a horse when it cantered past so that he could gauge their respiratory status. Again, this was new and valuable information for a novice looking at a Thoroughbred. Amy from New Vocations leading Come On Moe. As with last year, it was mesmerizing to watch experienced riders work with Thoroughbreds in the midst of transitioning to new careers. That these horses responded well to compassionate experienced rides is an understatement, but also a strong testament to their trusting, willing nature. Try to imagine taking your first jump by trotting into a sea of faces set upon rows of bleachers; it could be intimidating, to say the least, but each of the three horses (ridden by eventer Tracey Bieneman, Rolex competitor Daniel Clasing, and returning rider/trainer Eric Dierks) jumped small fences of increasing complexity. It was here that Phillip Dutton also kept making an important point: those horses that did not immediately show bravery to a fence were not at all dismissed, but rather Phillip appreciated their carefulness. 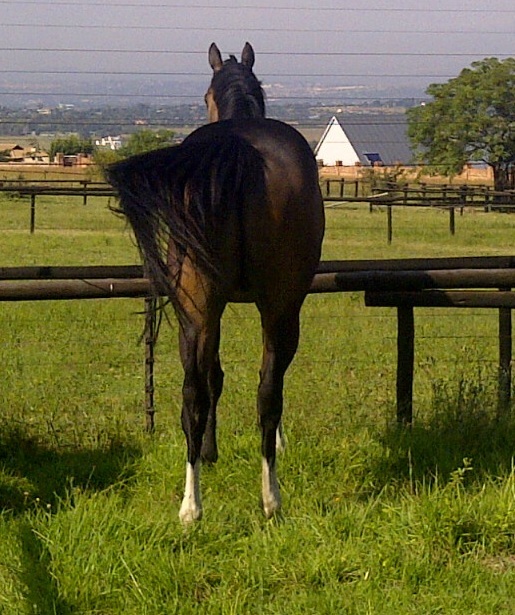 He knew, as we all soon witnessed, that the horses would gain confidence as their exposure increased. As I watched this segment I found myself brimming with pride at the progress these horses were making. They settled in, figured out what was being asked of them, and did their jobs. Daniel Clasing takes a break from Rolex competition. The eventing world was well-represented at Thoroughbreds For All! as eventers bracketed the evening. We were first introduced to several competitors whose Rolex mounts were Thoroughbreds and these riders had about 500 keen listeners as they talked about their horses’ strengths and talent (and a few quirks, of course). To close the evening, local eventers Dorothy Crowell and Cathy Wieschoff returned with their upper level eventers Hennessey and Ready For April. This was a fitting close to the evening as the two beautifully conditioned horses did a little warm up and then proceeded to jump some impressive fences. They were such pros, their demeanor so professional and business-like and it was a brilliant way to demonstrate the rewarding path from a racehorse off the track to a well-trained eventer. Remember how lovely Bilan jigged and danced for Chris McCarron? I bet even Ready For April did that when he came off the track. But it was impossible not to think of Bilan as an eventer-in-the-making. All he needs is a chance to prove himself. Thoroughbreds For All! is helmed by Steuart Pittman of the Retired Racehorse Training Project and Anna Ford of New Vocations and an army of their volunteers. Each and every volunteer I spoke with was not only kind and gracious but also absolutely in love with Thoroughbreds. They are invested in making a future possible for each and every horse lucky enough to walk off the track and into their programs. There are so many good things to say about New Vocations’ event “Thoroughbreds For All” that I hardly know where to begin. The event was flawlessly planned and executed. Attendees were greeted first by volunteers and then by the sights and smells of a country buffet served in West Wind Farm’s covered arena. Round tables were full of newly-acquainted horse people who enjoyed the sunset meal and conversation: the mood was bright and upbeat. An OTTB wins at Rolex: It would be a fitting end to a very Thoroughbred-centric weekend! Photo: Wendy Wooley/EquiSport Photos. This scene played out literally in the middle of horse country, near Lexington, Kentucky. From one’s bleacher seat under the canopy of a covered riding arena, looking out at the breezy green April countryside, one suddenly became aware of a pretty little bay horse walking in, and then another. 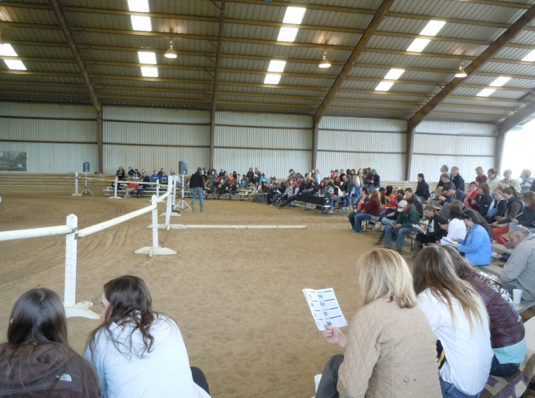 Hosts Steuart Pittman and Anna Ford introduced themselves and the horses, and all eyes fell upon the two bays…and then a third bay… and so it went until a nice selection of Thoroughbred ex-racers were introduced. Soon enough, Steuart and Anna were joined in the arena by eventers Bruce Davidson Sr., Cathy Wieschoff, and Dorothy Crowell and by equine vet Dr. Steven Allday. They passed the microphone between them as they assessed half a dozen Thoroughbreds that are now in the New Vocations program. Cathy and Dorothy were much alike in their assessments, both seeming to prefer a more short-backed horse (Cathy mentioned that it seemed easier to “connect” them) whereas Bruce pointed out that his best jumpers had been long-backed horses. Dorothy uses a simple assessment tool when considering a new horse, simply called the three S’s: sound, sane, and a horse that makes her smile. Dr. Allday commented on the specific medical issues with each horse. Three horses were selected for a riding demonstration that would follow. But first, jockey Chris McCarron brought two students from his NARA jockey school that he mounted on two of the New Vocations thoroughbreds. Chris focused on his riders’ hands and talked about a technique he teaches called “down and low with the reins.” It is his experience that this technique produces a quieter mount and that Thoroughbreds seem to respond well to it. He complimented his two student riders on their soft hands, which he felt was an essential skill. Chris then donned his helmet, mounted one of the horses, and produced a brief but beautiful ride, demonstrating not only three gaits, but also a lead change. Dorothy and Cathy got a chance to showcase their off-the-track mounts. Under Dorothy’s care, her young horse Hennison gets work every day. And yes, that means jumps, too. She warmed him up as the fences were set, talking gently to him as well as the audience, and then let him trot several jumps before he trotted in and cantered out of a double combination. Dorothy mentioned she worked with her horses for four to eight years before bringing them to a four star level. Cathy’s horse Ready For April is eventing at the preliminary level, and he is flat-out lovely. She is an advocate for ground work with a rope and trains all of her horses with this method. 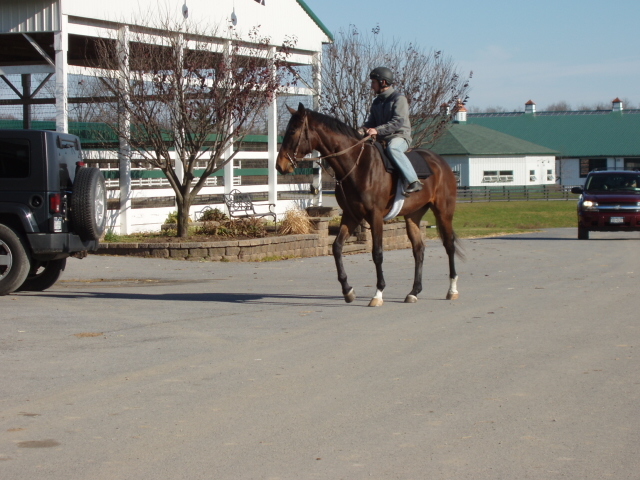 She demonstrated by trotting Ready For April over a new jump before mounting and riding him over it. Her delight in her horse was infectious. I couldn’t take my eyes off him. To close the evening, the wonderful eventer Molokai, still a looker at age 29, pulled Dorothy into the arena as she talked a bit about their years together. “Mo” put a classy finish on the evening, reminding everyone what is possible when a horse is given a chance to prove himself as an athlete. The American political system is passionate about reviewing what the president has achieved after 100 days office. It regards it as a good measure of things to come. I think the same can be said when you get your ex-race horse off the track. The difference is with good and focused work, an adequate review can be made within only 10 days. 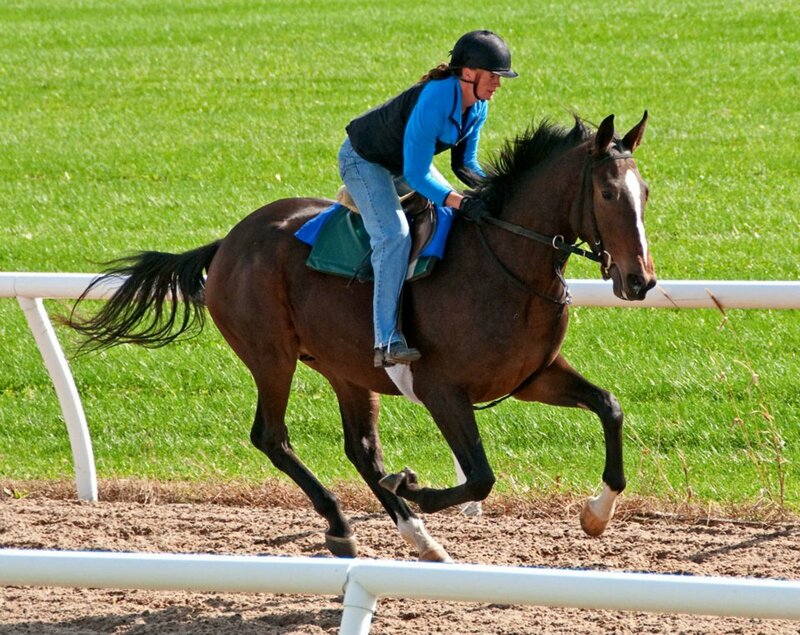 Thoroughbreds that have raced are used to routine and work. The racing barns are stressful environments – and they are run like machines. There are set times to work, to eat, etc. What this often means is that your new horse will probably take a bit of time adapting to his new environment with you. For example, if he gets paddock time this may come as a bit of a shock. Racing horses in training often don’t get much paddock time in order to prevent injury. What this all also means is that your horse will be used to working, and you can expect him to apply himself to his work from day 1. Therefore don’t baby him – work him. If you need to, ask him kindly and firmly to perform to standard – but do it for shorter periods of time. Doing 20- 30 minutes of focused work correctly is better than an hour of incorrect work. He can build up from there over time. Your horse must immediately learn that a new environment means new rules. If you teach this from basics, it will make it easier for him. The start is that he learns to stand still when requested. Jockeys often mount and move off immediately. I teach my horses to stand still when I mount. They must stand patiently until I ask them to walk. It’s a basic of obedience in riding for a horse – move forward on command and halt on command. At this point I don’t worry too much where his head is, as long as his nose isn’t poking up to the sky. A more confident horse because he is sure where to go and what to do. I’ve just started producing my new baby King William who has just come off the track. Within the first week I worked him with other horses and rode him in a warm up arena at a training show. Riding with other horses produced high excitement – especially when they came towards him. Socializing an ex-race horse means they have to learn to work with other horses in a variety of settings. As long as we ride them calmly and confidently this can be achieved. (Though I have to say I also had to manage to sit a few fly leaps as well). What they also have to learn is that the music at shows doesn’t have to get their adrenaline up – they are not about to race. I’m all for taking the ex-race horse to show environments as soon as possible. Let them walk around, watch and stand still when you ask. If there are not hundreds of ponies galloping around the warm up arena madly, do some quiet work in the warm up arena. The idea is to let your horse have a good and calm working experience, not make them crazy. Exposing your horse to new things can also mean that you can introduce him to pole work. I think walking and trotting over poles from the beginning of training is great for show jumpers in the making. It can’t harm their joints but it teaches them to pick up their legs and start judging distances. They also learn not to be scared of poles. The racing yards are somewhat impersonal. There are a lot of horses and they are there to work. Some lucky race horses that have companionate owners and/or trainers, and they get placed in good homes with people who will look after and love them. These ex-race horses need to ‘learn to be loved’. Each horse is different and some like to be fussed over and cuddled more than others. But there is nothing more rewarding than giving a horse a good home. The information you get from these first 10 days can help you moving forward. It gives you a good idea where you are working from. If you diarise it, it will be great to look back on one day. 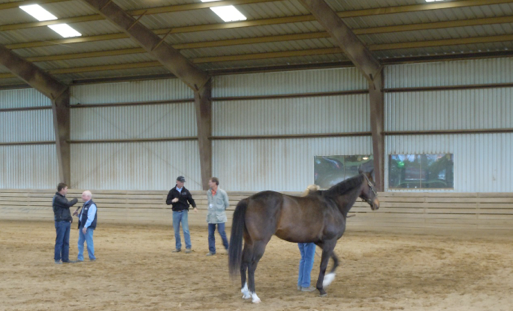 The more detailed you are the more you will notice progress because young horses learn in small steps over time. The information also provides keys to your training programme. Each horse is different and we need to work with them in different ways. This all also helps you to nurture what will hopefully be a wonderful and fruitful partnership with your ex-race horse that develops over time. Tanya van Meelis is a competitive show jumper with two horses. She has the blog Horse Thought. It’s a gloriously, happily, exhilaratingly, ridiculously small horse world. I spent a wonderful morning last November with a friend of mine, Monica Driver, who I simply never see enough of. She’s great company. We talk books, dogs, politics, and that’s just in the first five minutes. We were watching two of the young horses she bred, Analysis and Circuitous. The colts were training on the farm where they live when in New York. I snapped a few pictures. Little did I know the small world would start spinning. 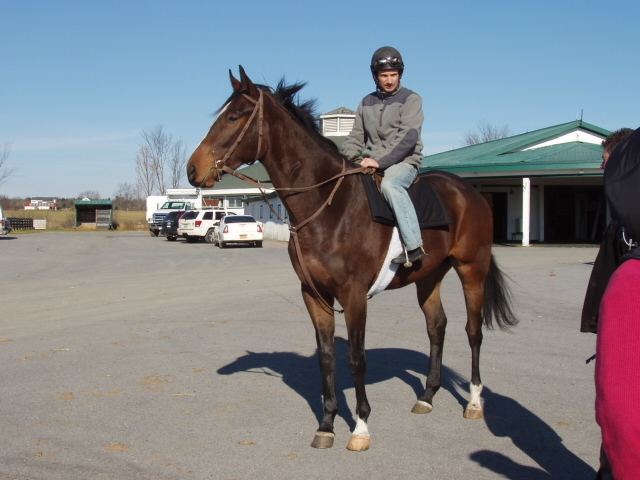 This is Analysis (by Freud, of course) as a long yearling that late November 2011 day being ridden at Stone Bridge Farm, New York. Analysis is Circuitous's half brother. The pictures provide glimpses of a training farm and the routine a young horse in race training goes through. It was a day exemplifying what one of my heroes William Steinkraus says makes for a good day’s training: nothing happens. Circuitous is such a lovely bay I forget I’m a grey-aholic. Maybe because his sire is that grey poster boy: Skipaway. Others might even forget for a nano-second or two their passion for chestnut mares. Circuitous’s demeanor as much as his looks captivates. He’s outgoing yet calm in his stall, happy to interact with humans, and developing a prodigious work ethic and concentration. Monica is an owner who manages Mosaic Racing to race her fourth generation homebreds. 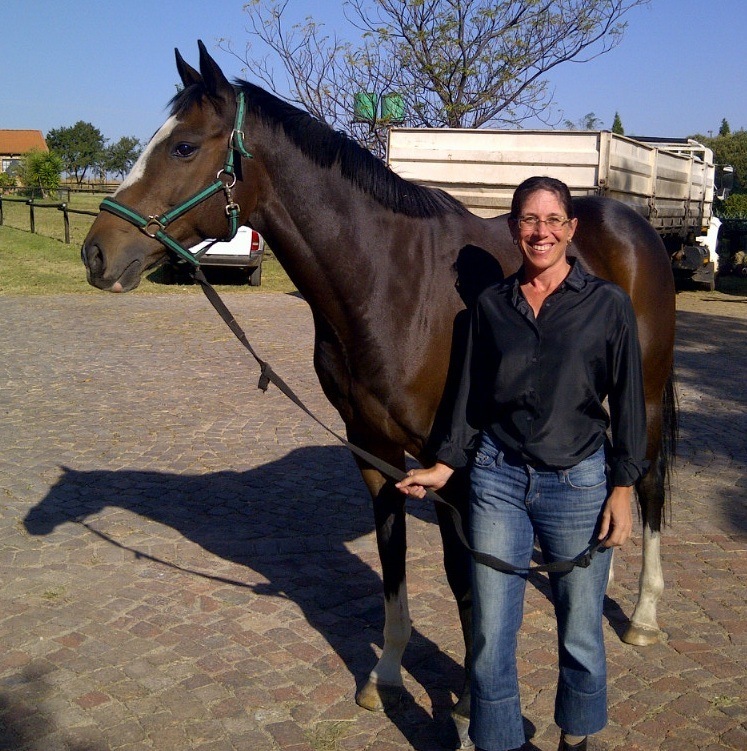 Monica has her horses thoroughly trained and provides funds for their life after racing. Just as all OTTBs are not the same by reason of conformation, soundness or innate temperament, OTTBS vary based on handling and training regimes in their formative years. Circuitous looking at Monica. Her shadow is on the right. A cool, crisp day and the young Thoroughbred stands almost perfectly square only moving his ears to keep track of the conversation. Small world event number one occurred when Susan Salk profiled Circuitous and his winter training regime on her blog offtrackthoroughbreds.com. The humans kept talking. Circuitous has become interested in something else. His head is alertly up but he's relaxed as the brisk November breeze lifts his mane and fringes his tail. Small world event two happened shortly after Susan’s profile appeared. Another friend, Amy LeBarron, mentioned what a pity there wasn’t a picture on Off-Track Thoroughbreds of Circuitous being ridden by his New York exercise rider, Gavin. Amy inspired me to dig up my snap shots of Gavin on Circuitous. As the small world was turning Amy came up with a photo of herself riding Circuitous in New York. Event number three. What synchronicity. Amy was the person who skillfully, tactfully, patiently, positively, and with a sense of humor backed and trained the first two Thoroughbreds I bred. Here is a visual example of her doing the same for Circuitous. Amy riding Circuitous mid-October 2011. Event four shrunk the small world down to about tennis ball size. Heidi White has been on my radar for many years thanks to her international advanced level 4-star Thoroughbred Northern Spy. Northern Spy shares his name with the Vermont goat farm with Thoroughbred connections owned by friends of mine, Brad Kessler, and Dona Ann McAdams. Lo and behold, Heidi White is the woman training Circuitous at his winter digs in Aiken. Years ago I reveled in the name connection, now here was one even more concrete. Followed by a vehicle Circuitous remains flat footed as he learns to walk around the farm on his own. Gavin keeps watch while Circuitous seems to have completely placed his trust in his rider. Event five might stretch credulity so I hesitate to include it, but to get my horse world down to pingpong ball size it was Amy who sparked Dona’s photography of Thoroughbreds. Oh and by the way, does this make this horse world example ball bearing size if Circuitous is the front page horse on the Stone Bridge Farm website, where White trains? One can never see enough pictures of Thoroughbreds walking calmly, especially when they're three, in race training, and it's a brisk, breezy, cool, November day. This is the kind of "early childhood development" that makes for great OTTBs. So, thank you Monica, Amy, and Susan for the opportunity to wallow in warm memories of a November morning with Circuitous and friends sharing our appreciation for Thoroughbreds. International Women’s Day was March 8th this year. In recognition of my own ridiculously small horse world peopled with warm friends I hereby declare today, March 27, to be Local Thoroughbred Women Friends’ Day. A toast to small horse worlds. It’s been fun to celebrate with you. Here’s to a thoroughly friendly day in your horse world. Circuitous galloping. 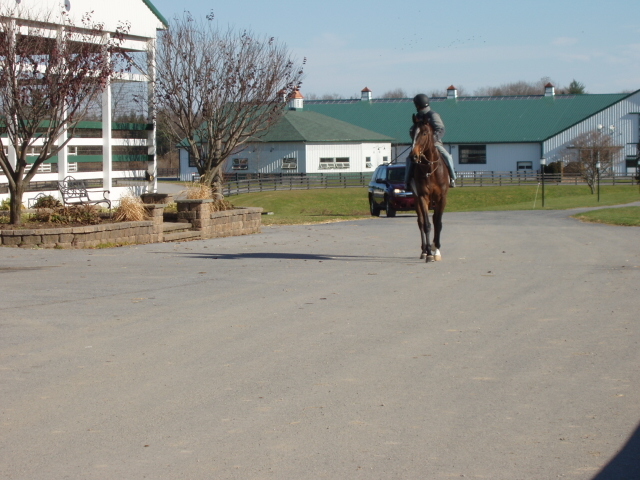 This unedited point and shoot picture shows his length of stride and balance. Before this winter's round of training in Aiken you'll see he's not boring down on the forehand as so many horses might do at his age. This post is by Katie Hill, a professional trainer who writes about horses at Reflections on Riding. Katie and I share a fondness for hot horses, and if you’d like to join the fan club, check out her tips below for a confident ride on a confident horse. 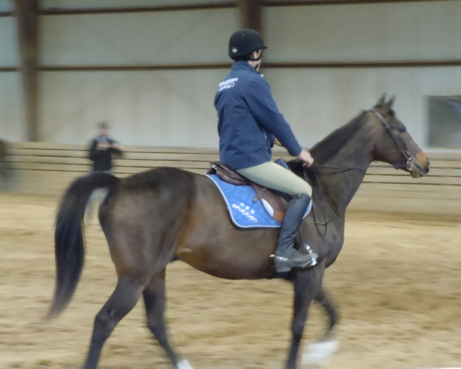 I love Thoroughbreds (and I’m guessing you do, too, or you wouldn’t be reading Natalie’s blog). I’ve been riding ex-racehorses since I was a child, when Thoroughbreds off the track were the trade up from Shetland ponies. Today, when so many other breeds (or in the case of warmbloods, registries) have unseated Thoroughbreds from their rightful place in the stable, I have to remind people that not every Thoroughbred is hot. If you don’t want a hot horse, I tell dressage riders and hunter/jumpers alike, then just look for one that’s not. There are plenty out there. Which will leave more hot Thoroughbreds for people like me, who really like them. Why do I like a hot horse? Training a hot horse to be “hot off the leg” is easy. Sensitivity is built in. Expressiveness, even brilliance, often come gratis with the hot horse. I’ll admit, though, that hot horses’ behaviors can be challenging. Rushing, rearing, bolting, studly neck-shaking, and playful bucking are only some of the shenanigans. (According to the Encyclopedia of Word and Phrase Origins the origin of the word shenanigans is likely the Irish sionnachuighim — “I play the fox” or “I play tricks” – inspired by an Irish Thoroughbred, perhaps?). 1. Manage the problem while you’re not in the saddle. Lots of turnout. Room to run. Preferably with others if you can manage to dispense with hind shoes. Free choice hay. No sweet feed. 2. Discover what you need to do to get your horse calm (remember “Calm, forward and straight,” the mantra of Alexis L’Hotte, Ecuyer en Chef at Saumur from 1864 to 1870). Maybe the only way you can get calm is to start work with your hot horse in trot. Or in canter. Work up (or should I say down?) gradually to what should ideally be your warmup — a 10 minute walk on a loose rein. 4. Don’t get sucked in. When you’re with your horse, on the ground or in the saddle, the agenda is yours. (See above, though; don’t be a prison guard.) Don’t fight the misbehavior. Correct and move on. Don’t take any of it personally. Smile, laugh or sing if you can. 5. Be brave. If being on a hot horse scares you, work on it. But work on it somewhere else than on your horse’s back. 6. Voltes (or small circles) are your friends. If your horse is rushing and your half-halts meet with “la la la, I CAN’T HEAR YOU!,” ride a volte. Voltes are easier when horses are balanced, so horses end up trying to rebalance themselves and that slows them down naturally. 7. Be the kind of partner everyone wants — reliable but also fun and creative. Keep sessions with your horse interesting, employing lots of different figures, lengthenings, cavaletti, jumping, liberty work (hot horses love liberty work) and changes of venue. Transitions in and out of gaits are useful and important, but try not to live there (overdo it, or do it tactlessly, and you’ll drive your hot horse insane). If you feel up to it and there’s a place to do it, there’s nothing like a good gallop. 8. Lunging is a great tool, but not to get the energy out. That won’t work with a hot horse. Most hot horses have “no bottom,” as they say. If your hot horse is racing fit on top of it, you’ll just add fuel to the fire. But lunging is a great tool for focus and freedom (leave off the side reins) and the ritual can be calming to a hot horse. 9. Make sure your hot horse isn’t rushing away from pain. Check for ulcers, and if you suspect something’s amiss, check in with your vet. Vets with a focus on holistic medicine can rebalance a hot horse with alternative remedies ( Dr. Xie’s Jingtang Herbal’s Shen Calmer is magic). Maybe your horse has a magnesium deficiency (Performance Equine’s magnesium is getting rave reviews). Maybe one of the other calming supplements would help. They’re finding out that Omega 3 deficiency may be linked to ADHD; why not try Wellpride? 10. Finally, embrace the power. Enjoy it and see where it can take you. Today’s Guest Post is from Jessica Boyd, who has a lovely herd of horses, including the star of this post, Calabar. Jessica writes Spotty Horse News and chronicles training, riding, and general horsey goodness. I didn’t start out as an advocate for OTTBs, no. I started out as one of three people sharing one delightful and athletic cow-horse-bred mare with long eyelashes and spots. Along the way, I have become one of what I hope is a growing number of people who realize the versatility of the Thoroughbred. With a few fits and starts, I have come to appreciate the breed for their ability to learn, their willingness to try, and the unique experiences that make them the horses they are. All because of a big brown horse named Calabar. Some might say I bit off more than I could chew, since I didn’t know much and he didn’t know much. I had not had years of riding lessons, let alone how-to-train-a-horse-who-only-knows-how-to-run lessons. I read the New Vocations book, Beyond the Track , tried to figure out contact, and probably succeeded in confusing Calabar more than directing him. I also took lessons, but most seemed directed more at teaching me what to do with my body and not so much how to help him figure anything out. Turns out helping him has helped me, but I’m skipping ahead. So I was not so great at teaching him where to put his head or his feet, but we took him out on trails and taught him to climb hills—up is still easier than down—and cross creeks and splash in the ocean. He learned that riding in the trailer did not mean going back to the track and we’ve had many adventures outside the arena. We’ve also had adventures in the arena that have not been so wonderful. In fact, they have been painful and frustrating. The trail saved us, got me past the low points and got us both somewhere we could both relax and therefore excel together. His natural curiosity responded to the very non-track-like things out on the trail—including geese, turkeys and deer. I once pointed him at a huge log—nearly belly high—on the beach and he walked right over it, much to the amazement of our exercise rider friend who lives and breathes “crazy” Thoroughbreds. Calabar is a very affectionate horse. because he likes knowing how to do things. He really doesn’t like not knowing how to do things, so the challenge for me—remember, I don’t know a lot, either—was figuring out what I wanted and how to tell him what that was. Having it make sense to him was also important. All that built on his nature, the nature that comes from who he is and where he has been. Calabar came off the track having seen all kinds of things that your average cow-horse has never encountered. It has given him a certain kind of worldliness—sometimes you are working past that worldliness and sometimes it plays right into your hands. Being able to sense the difference and respond appropriately will win you the heart—the very large heart—of a Thoroughbred. An OTTB is a challenge, of that there is no doubt. Are they too much for a rookie rider? As with any breed from any discipline, I would say it depends on the horse and on the person. Could I have done more with Calabar faster than I did? Yes, likely I could have. But would this journey have shown me as much about myself? Could I have walked it with any other horse and gotten to the same place? I would have to say no. I have been deemed worthy by this horse and he works as hard for me as he ever worked for his trainers. Differently, of course, but his heart, his trust, is mine. We don’t know much, either one of us, but we’ve already learned more than I ever dreamed we would. (Of course that is partially because I had NO idea what all we didn’t know.) However, between the two of us, we’re more likely than we ever were to figure out whatever comes next. At the moment, that is the sitting trot. Tomorrow? Who knows. My journey to OTTB fandom has not been easy, but like most converts, I am a bit of a zealot. (No, really?) 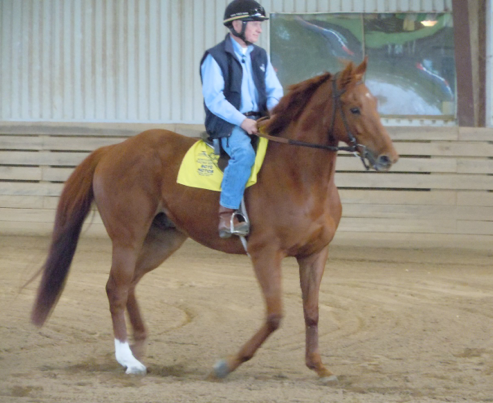 It won’t necessarily be overnight for all of us–or even six weeks like the trainers in the Retired Racehorse Training Project—but in my admittedly biased opinion, it is completely and totally worth it.